I love to read. And while there is joy in discovering new books, nothing quite touches the pleasure of rereading an old favorite. Finding Alice is one of my most beloved literary treasures. 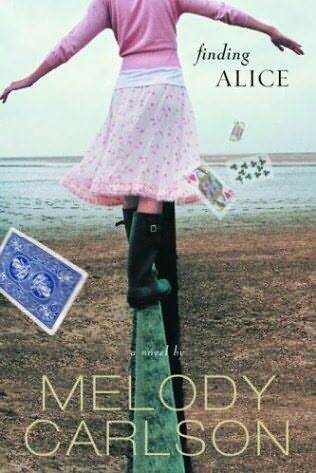 Melody Carlson’s book follows the troubling adventures of college student Alice Laxton as she slips down the “rabbit hole” of schizophrenia. Narrated by Alice, we’re led into a fictional world that for many is all too real. Along with her name, her story shares parallels with Carroll’s Wonderland and is something of a fairy tale, albeit a darkly possible one. If this all sounds a little menacing, don’t worry, Finding Alice may not shy away from the gritty, but it is still infinitely readable. This all attests to Melody Carlson’s talent as an author. She has written a veritable mountain of books including not only serious tales but also chick lit, children’s, teens’ and nonfiction. I’ve liked every book of hers I’ve read, but none of the others can touch Finding Alice. Carlson’s website said it will soon be a made-for-television movie, but I could not find any other info. I hope whomever the filmmakers are, they will realize the gem they have and attempt to do it justice (although that seems impossible). I haven’t read this one, will have to check it out! I’ve heard really good stuff about this book. I find the similarities between Still Alice (about Alzheimers, and I believe it came AFTER) interesting. Unrelated, but interesting. That story sounds intriguing. After all, even the original Alice is a lot darker than most people realize. Sounds very interesting. I think I will have to check it out.